I've just found another great option for the nail polish lover in your life, and it's from none other than actress Drew Barrymore, creator of the Flower Beauty brand available exclusively at Walmart. 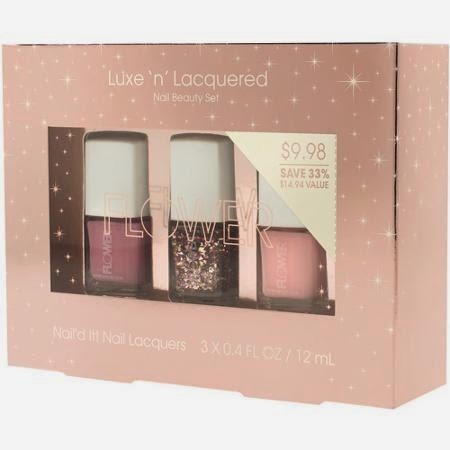 Flower by Drew Barrymore Luxe n Lacquered Nail Set, Rose Gold contains 3 Flower by Drew Barrymore nail lacquers in pretty, soft pink shades that will work for everyone. I was very impressed with the creamy, mid-weight polishes which also contain built in base and top coat. There is one lighter, pale pink shade and a darker, more dusky rose shade.The glitter polish in the center is a nice touch, with a combination of gold, pink and rose gold chunky glitter. This allows you more options to top off either of the other pink shades, create nail art or of course, wear on it's own. Go-->Flower by Drew Barrymore Luxe n Lacquered Nail Set, Rose Gold available at Walmart and Walmart.com.